Well, I did indeed manage to get over to Norwich on Friday afternoon and picked up some more flower cutters and a couple of new colours too, and I have spent most of the weekend 'playing' with them. I managed to produce a nice range of shapes and colours, hand tinting some of them for extra depth, and using pearlised dragees and various nonpareils for the centres. 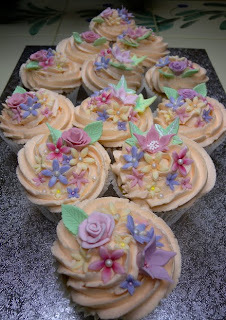 Also baked some rose flavoured cakes with rose flavoured frosting to put them on - yummy! 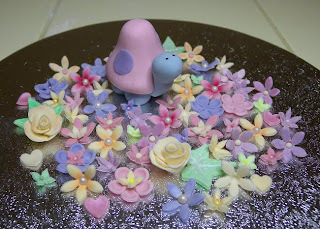 My confidence boosted, I decide to have a go at the little fondant tortoise tutorial on cakejournal.com, he's so cute and the tutorial is really easy to follow. I'm now feeling much more confident about flowers in particular, and handling and modelling fondant in general. All-in-all a good weekends work.